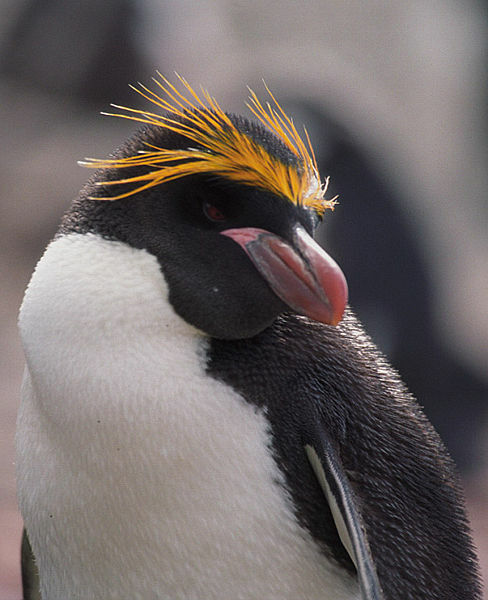 The Macaroni Penguin is a penguin species that is found from the Subantarctic to the Antarctic Peninsula. It is only one of the 6 species of crested penguins (Eudyptes) around the world. It was first described by the German Naturalist, Johann Friedrich von Brandt, on the Falkland Islands in 1837. This penguin was known by English sailors due to its yellow crest, and the famous song, ‘Yankee Doodle’ has even memorialised this penguin for life. In the 18th century, someone who had a flamboyant style or wore excessive ornamentation was called a ‘macaroni’. The Macaroni Penguin is a big crested penguin. As an adult, it has an average length of 70 cm. Male Macaroni Penguins weigh about 3.3 kg after incubation, 3.7 kg after they have moulted, and 6.4 kg before they have moulted. Females weigh about 5.7 kg before then have moulted, and weigh about 3.2kg after moulting. Their plumage is black, but has a blue sheen when it is new but brown when it is old. 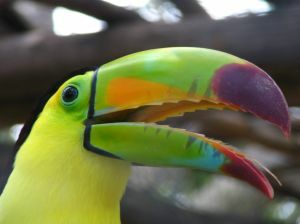 Their throat, chin, and head are black in colour, and it has white underparts. The most striking feature leading to 18th century macaronism would be the yellow crest that rises from the centre of the forehead and extends backwards in a horizontal form towards the nape. The flippers are blue-black on the upper surface with a white edge and white underparts with a black tip and a leading edge. They have a large and bulbous bill, which is orange-brown in colour. Their iris is red. Their feet and legs are pink. When Macaroni Penguins moult annually, they replace all of their old feathers. Before they moult, they spend about 2 weeks accumulating fat because they don’t feed during moulting as they cannot enter the cold Subantarctic and Antarctic waters to forage for food without their feathers. This process will take about a month, and spend this month sitting on shore. Once the process has completed, they will go back to sea and to their colonies to mate during the spring. In 1993, it was estimated that the Macaroni Penguin was the most abundant penguin species in the world. 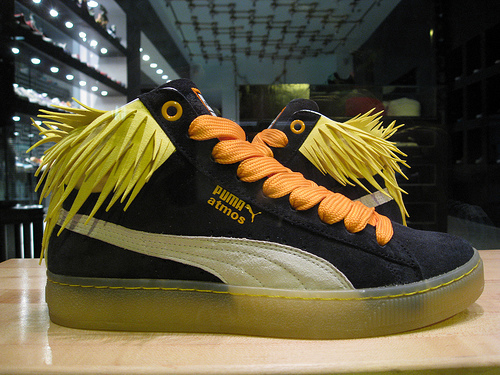 It was thought that there were a minimum of just under 12 million pairs worldwide. At least 216 breeding colonies at 50 sites have been recorded. They are found in southern Chile, the Falkland Islands, South Sandwich Islands, South Georgia, South Orkney Islands, South Shetland Islands, Prince Edwards and Marion islands, Bouvet Island, Crozet Islands, Heard and McDonald Islands, and the Kerguelen Islands. When they are foraging for food, they will go north to the islands off South Africa, Tristan da Cunha, southern Brazil, New Zealand, and Australia. Although the population of Macaroni Penguins is estimated at about 18 million, there has been a rather substantial decline in population in several locations. In South Georgia, there was a 50% decline during the mid-1970’s to mid 1990’s. They also disappeared from Isla Recalada, Chile. As a result of this large decline, they have been categorised as being Vulnerable. Now, both Heard and McDonald Islands have been labelled as World Heritage Sites for the Macaroni Penguin. It is thought that the reason for their decline is due to marine pollution and commercial fishing. It may also be due to climate as well as fishing induced reductions of krill density.